A GRAPHIC NOVEL DEPICTS HIGHS AND LOWS; WHO’S LOU? Almost every Motown principal has an Apollo Theatre story. In his autobiography, Smokey Robinson recalled how poorly prepared in 1958 were the Miracles for their debut at the historic New York venue. “We weren’t ready,” he wrote. “Weren’t nearly ready. We had our one little hit, but our routine was still raggedy. Didn’t even have real arrangements for the house band.” Headliner Ray Charles stepped in to help the group. “Never will forget that week ’cause in spite of Ray’s arrangements, we bombed,” Smokey admitted. His inability to dance didn’t help. Berry Gordy confirmed those miserable circumstances in his own book, while the Motown monarch’s second spouse, “Miss Ray,” told of another awkward occasion. The couple accompanied Marv Johnson to New York – in a 1959 Volkswagen bus driven from Detroit by musician Popcorn Wylie – for the singer’s Apollo debut. “I don’t give a damn who you are and who you are managing,” she recalled the theatre doorman saying when they walked up to the back door. “Marv Johnson, who the hell is that? Nope, can’t let you in. Go buy a ticket and come in the front like everybody else.” Eventually, he was instructed to admit them. 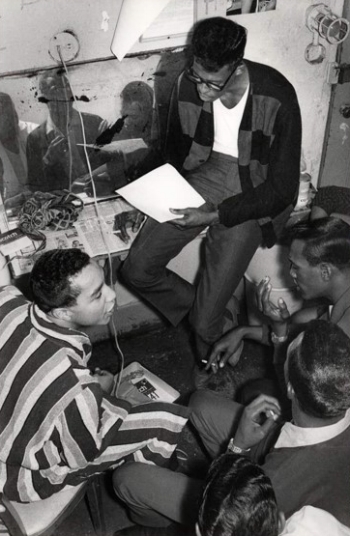 "Here's how the song goes..."
Five years later, Motown stars were receiving a warmer welcome, although the no-frills nature of the Apollo dressing rooms was apparent in the now-iconic photograph taken there of Robinson teaching a new song to the Temptations. This was, of course, “My Girl,” introduced to the quintet when they, and the Miracles, were performing at the theatre in early October 1964. A less-familiar tale is one from June 1969, when the Temptations were playing the venue once more. This time, the action was in the office of Apollo top dog Bob Schiffman, where he and his PR man, Frank Long, were in the company of Don Foster, personal assistant to Berry Gordy. Joining them were three men associated with a New York-based organisation called the Fair Play for Black Citizens Committee. This trio, fronted by Clarence “Mookie” Jackson, was not happy, accusing Motown of failing to support black causes while being all too ready to back Jewish and other white agencies. The atmosphere was ugly. To those accustomed to the deep detail and insightful minutiae of the original Showtime at the Apollo, the new edition is lighter, literally and metaphorically. “My aim,” explained Fox, “is primarily to tell the story to a younger audience – under 50, actually – who are comfortable with, and enjoy, this format. My challenge was to hone my comprehensive book into a compelling, focused narrative.” Many colleges and high schools are using graphic novels to teach history, he added. If this approach is what’s required to celebrate and sustain cultural institutions such as the Apollo, so much the better. Fox and Smith are to be commended, as are U2, Jay-Z, Bruce Springsteen, Guns N’ Roses, Bruno Mars and others for keeping the palace on West 125th Street in the public eye in recent times. Showtime at the Apollo will be available in this new form in January 2019, published by Abrams ComicArts to coincide with the Apollo’s 85th anniversary that month. During the past 84 years, showtime at the Apollo was undeniably memorable for hundreds of thousands in the audience – but evidently not always entertaining or joyful for those backstage. Music notes: Crudely recorded though it was, Motor Town Revue Vol. 1 is authentic and exciting to this day, with the line-up of artists as illustrated above. The LP was released soon after the package tour's ten-day run at the Apollo in December 1962, and made its Billboard chart debut 55 years ago this month. It was reissued on CD in 2005 as part of The Motortown Revue Collection, which is how you can hear the music on streaming services today. Enjoy.